Do you have a go to meal? A meal that you cook when you need dinner but don't feel like doing anything too fancy, or you've just returned back into town and don't want to go to the grocery? Well for us, that meal is spaghetti carbonara. It's basically like breakfast-for-dinner's grown up sister-- eggs + bacon + cheese + pasta instead of toast. A meal that we can always pull together without going to the grocery store (yes, I consider bacon a staple). I don't really have a recipe for this, but more a process of how I make it. 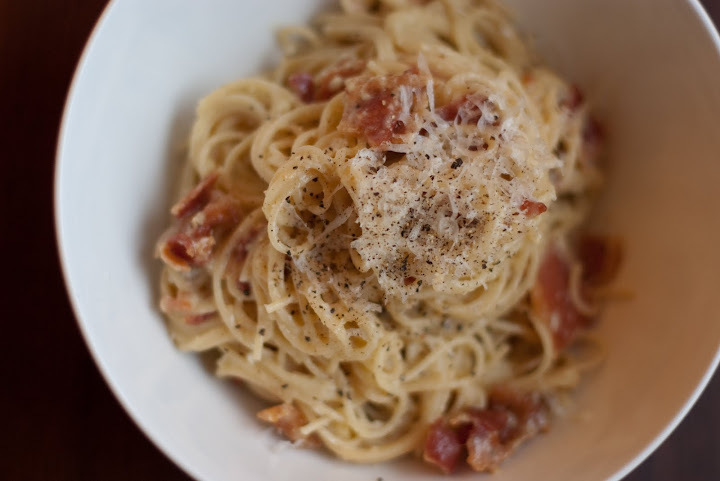 If you want a more formal recipe, check out Tyler Florence's Spaghetti alla Carbonara. Cook bacon or pancetta and then crumble into little pieces. I do 2 slices of thick cut bacon per serving of pasta. Boil spaghetti in salted water. I usually make 3 servings (156g) for the two of us. While the pasta is cooking, scramble (updated) whisk 2 eggs and add a hefty amount of grated parmesan cheese and freshly ground black pepper. When the pasta is al dente, drain the pasta and immediately pour the egg mixture over the piping hot pasta. Add bacon and continuously mix until the sauce has thickened. It's also smart to reserve a little bit of the starchy pasta water in case you need to thin out your sauce. Season with salt and additional pepper to taste. Usually I mix in green peas as well, but we didn't have any this time. If you find that your sauce isn't thickening, it's sometimes helpful to combine everything over very low heat. To scramble eggs means to heat/cook beaten eggs. The eggs for the carbonara sauce should be whisked, seasoned and then the mixture should be added to the hot pasta. The heat from the pasta will "cook" the eggs. Made this last night and I am eating the leftovers now for lunch! :-) Oh and in case you were wondering...it goes great with back-porch lemonade! Haha! Yay! Glad you made it... guess it turned out tasty if you're having it for leftovers!